Are you interested in having a career at Breeze Dairy Group? Head over to our CAREERS page for more information. Together, we have more than 200 years of combined farming experience. Farming looks different today than it did when our grandfathers farmed, however our commitment and dedication to being environmental stewards and caring for our cows remains the same. The Breeze Dairy families are dedicated to each of the communities where we live and farm. We own and operate three farms in Wisconsin: Lake Breeze Dairy, Pine Breeze Dairy, and Spring Breeze Dairy. We are excited and proud to be developing our fourth: North Breeze Dairy. We pride ourselves in the fact that each of our families came from a farming background. Here are photos from our family farms before coming together to form our first Breeze Dairy Group farm, Lake Breeze Dairy. Family farming roots run deep for all five of our Breeze Dairy Group families. Our fathers, mothers, grandparents, and great-grandparents farmed the land, working late into the night harvesting crops, feeding and milking cows, and repairing machinery. Today, our families work as partners, combining not only our cows and land, but also applying our expertise to focus on caring for our cows on modern farms. In 2002, five families came together to unite their passion for dairy farming and formed Breeze Dairy Group. With shared core values and a commitment to caring for cows and the environment, each family is dedicated to the future of agriculture. After working closely with dairy farmers as a dairy nutritionist for years, Lynn Davis learned that Mark Diederichs, Ron and Rick Schwenck, and Doug Thiel had plans of expanding their home farms. Lynn knew the families had a similar vision and brought them together. The four families worked with Brian Gerrits, a farm consultant at the time, and began developing a business plan to build Lake Breeze Dairy in Malone, Wisconsin in two phases. Brian joined the group as a partner during the development of phase one, and the partnership was complete with five families. Phase one was completed in 2003, when we began milking 1,500 cows. Two years later, phase two of Lake Breeze Dairy was completed, and 3,000 cows are still milked on the farm today. Recognizing the strength of working together and seeing the success we shared with Lake Breeze Dairy, the five families began looking for opportunities to expand our years of agricultural expertise to other farms. Pine Breeze Dairy in Pine River, Wisconsin was the second farm to join the Breeze Dairy Group family of farms, also in two phases. Phase one was a test phase; we leased the farm and milked 400 cows while researching the opportunity of a second phase to grow the farm to a 2,400-cow herd. Phase one was a success, and we moved forward with phase two. In 2013, we began milking 2,400 cows at Pine Breeze Dairy. The same year, Breeze Dairy Group became an official LLC. The most recent addition to the Breeze Dairy family of farms was Spring Breeze Dairy in Bryant, Wisconsin in 2015. Unlike Lake Breeze and Pine Breeze, Spring Breeze Dairy was an existing farm and not a new construction or substantial expansion. The newest farm that will be joining the family of farms is North Breeze Dairy in Stetsonville, Wisconsin, with plans of construction in 2018. Over the last decade, Breeze Dairy Group has established a reputation for providing high-quality milk; exceptional animal care; and being environmental stewards of Wisconsin’s land and dedicated members of the communities where we farm. View a map of each of the current Breeze Dairy Group, LLC locations. Our cows’ comfort and well-being factors into every decision we make so the cows are at their best to produce wholesome, high-quality milk. Our cows lie on sand bedding, which is the most comfortable bedding available. Several times a day the beds are cleaned to remove any debris. More sand is added to the beds twice a week to ensure cow comfort. All of the freestall barns are properly ventilated, using fans and curtains to move the air. The freestall barns provide shade and a cool breeze for the cows in the summer, and in the winter the barns keep the cows sheltered from the wind and snow. In the freestall barns, the cows can eat, drink, and rest whenever they like. Employee training on animal care and husbandry is continuous at all farms. Occasionally, we have industry experts conduct special, on-farm training programs for all employees. Our goal is to have consistent cow-care techniques across all farms. Additionally, our employees regularly attend cow care programs to keep up-to-date on best animal care practices. The farms that are part of the Breeze Dairy Group family are enrolled in the Farmers Assuring Responsible Management (FARM) animal care program. This is a national program that sets the highest standards when it comes to animal care. FARM provides an animal care reference manual farmers must follow for every cow and calf on the farm. These guidelines evolve with the latest research on quality animal care. The FARM program evaluates farmers at least once every three years and provides feedback on how we’re doing by qualified auditors. The evaluation provides us with the information we need to develop action plans for continuous improvement. Like our forefathers, Breeze Dairy Group is passionate about protecting the land and conserving the water in Wisconsin. Dairy farmers are held to high environmental standards, and we go above and beyond what is expected of us. All the farms in the Breeze Dairy Group family use the latest technologies to preserve and protect the environment. We work with a team of experts who guide us in decision-making to ensure everything we do is safe for the environment, our neighbors and the communities around us. Clean water is a fundamental part of dairy farming, and we have many practices in place to ensure we conserve all the water used on our farms. At each farm, the amount of water used is monitored daily. We establish strict targets for how much water we expect to use from the wells, carefully study the reports that are generated, and make adjustments if our goals aren’t being met. The water that is used in our milking parlors is run through a cooler, recycled and used again as drinking water for the cows. At Lake Breeze Dairy, recycled water is used to flush the waste from the freestall barn alleyways. On Breeze Dairy farms, we do more than only recycling water. We recycle and reuse the sand bedding in all of our freestall barns; on our feed piles, we reuse recycled tires to hold plastic down to protect our cows’ feed; and, we participate in the recycling program with Revolution Plastics and recycle the plastic used on top of the feed piles at Pine Breeze Dairy. We are continuously looking for new and innovative ways to guarantee the land and water are well-cared for and protected for future generations. Lake Breeze Dairy was the first farm established under Breeze Dairy Group in 2003. 3,000 cows call Lake Breeze Dairy home. These cows make 26,500 gallons of milk per day. The cows are milked in a double-44 parallel milking parlor. There are 35 employees dedicated to caring for the cows on the farm. The milk from the cows is shipped to Foremost Farms in Appleton, WI where it is made into cheese. 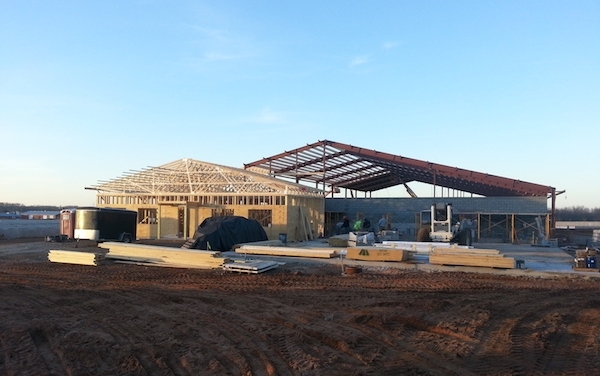 Pine Breeze Dairy was the second farm constructed by Breeze Dairy Group in 2013. There are 2,400 cows at Pine Breeze Dairy who make 20,000 gallons of milk per day. The cows are milked in a double-35 parallel milking parlor. 30 employees are committed to their care and comfort. The milk made at Pine Breeze Dairy is shipped to Agropur in Weyauwega, WI where it is made into award-winning cheese. Spring Breeze Dairy is the latest addition to the Breeze Dairy Group family of farms, purchased in 2015. Spring Breeze Dairy is home to 1,800 cows, making 16,000 gallons of milk per day. The cows are milked in a double-24 parallel parlor. 35 employees make sure the cows at Spring Breeze Dairy have the best care possible. The milk from Spring Breeze Dairy is marketed through Dairy Farmers of America. Plans are currently being developed to grow the herd from 1,800 cows to 3,500 cows. North Breeze Dairy will be the fourth farm to join Breeze Dairy Group family of farms. The project began in 2009 with the purchase of land in Taylor County. North Breeze Dairy will be home to 4,000 cows. 40 to 50 people will be employed on-farm in addition to working with local businesses. North Breeze Dairy will employ the latest in dairy science and technology, water conservation and environmental protection in this state-of-the-art facility. Agriculture is the backbone of Taylor County, providing 37% of the jobs and generating $972 million annually in economic activity. North Breeze Dairy will further enhance the economic activity in the county, providing on-farm jobs and contributing to the local businesses in the area. Dairy farming is a key industry in Taylor County, with on-farm production and milk sales accounting for $88 million annually. Caring for our cows is a top priority on all our farms. We use the latest innovations to ensure their comfort and well-being to produce nutritious, wholesome milk. Born and raised on his parents' 40-cow dairy farm in Oneida, Wisconsin, Brian Gerrits returned to the farm after completing high school. Eventually, Brian and his father formed a partnership, with Brian purchasing the farm in 1989 after his father passed away unexpectedly. Brian continued to farm with his wife, Lynn, and three sons, expanding the herd to 75 cows shortly after purchasing the farm. In 1990, Brian and Lynn had the opportunity to go to a conference in Florida and visit a 5,000-cow farm. At the event, Brian realized the direction the dairy industry was going and wanted to be a part of it. When he came back from the conference, he began to look for opportunities to partner with other farmers who shared his vision. With ten years of experience building and working with large dairy farms, Brian worked as a consultant, helping farmers develop and carryout business plans to build or expand dairy farms. Through his work consulting, Brian met Lynn Davis, Mark Diederichs, Ron Schwenck, and Doug Theil. Brian worked with the four partners as their consultant to build phase one of Lake Breeze Dairy. During the planning process, Brian was invited to join the partnership with the rest of the group. Initially, Brian selected the cattle to fill the barns and put systems and protocols in place so the farm would operate smoothly. From there, Brian moved to managing the business and financial affairs on the farm. After those areas were running efficiently, the partnership moved forward onto phase two of Lake Breeze Dairy, bringing it from 1,500 cows to 3,000 cows. After the second expansion of Lake Breeze Dairy, Brian had more opportunities to work on the business side of the organization. In 2005 he began working full-time for the dairy. Shortly after, in 2007, when Lake Breeze Dairy was fully operational, Brian approached the group about building another dairy, just as they had with Lake Breeze Dairy. The group agreed, and they started down the path to officially becoming Breeze Dairy Group. Today, Brian leads the business affairs of Breeze Dairy Group. He and his wife Lynn have three sons. The two younger sons, Bradley and Geoffrey, are actively involved in the organization. Bradley is the Site Manager at Pine Breeze Dairy. Geoffrey manages the finances and IT for Breeze Dairy Group. Their oldest son, Curtis, is an agricultural loan officer and resides in Minnesota with his wife Cassie and their three children. Mark Diederichs knew at a young age that he wanted to be a dairy farmer. Growing up on his family's 60-cow dairy farm near Johnsburg, Wisconsin, Mark was always passionate about working with dairy cattle. After graduating high school, Mark returned to his family farm and spent the next few years managing the herd. In 1982, Mark married his wife Laurie. At that time, he was still working on his family's farm. A couple of years later, Mark bought the cattle from his father and rented the buildings and land from him for several years before he purchased the land and buildings from his parents ten years later. Mark rented land and began purchasing feed from a neighbor in 1995 to focus solely on the herd, which he expanded from 60 to 150 cows. After farming with 150 cows for about four years, Mark and Laurie knew they wanted to expand the herd and began looking at options. Lynn Davis, Mark's long-time nutritionist, approached Mark about a partnership to build a large dairy in early 2000. Together, the partners developed a business plan to build what is now Lake Breeze Dairy. During the construction of phase-one of Lake Breeze Dairy, Mark continued to manage his 150-cow herd while also overseeing the construction of the new dairy. When Lake Breeze Dairy was completed, the majority of Mark's cows moved to that farm and Mark began managing Lake Breeze Dairy. Today, Mark continues to manage the daily operations at Lake Breeze Dairy. Mark and his wife Laurie have three children. Of the three, their middle daughter, Heather, works at Lake Breeze Dairy with Mark. A couple of miles down the road from Lake Breeze Dairy, Ron Schwenck grew up on his family's 60-cow farm. After attending the University of Wisconsin-Madison and receiving his bachelor's degree in dairy science, Ron returned home to purse his passion and farm with his father. When his son Rick, who is also a partner in Breeze Dairy Group, graduated from college and was considering returning home to farm with his father, Ron knew they had to expand their 60-cow dairy to support both himself and his son. While Ron was contemplating an expansion, he had discussions with their nutritionist, Lynn Davis, and the opportunity to form a partnership and build Lake Breeze Dairy was presented to him. The timing was ideal, so Ron and Rick joined the partnership. After Lake Breeze Dairy was built, the cows from Ron's home farm moved there. After the milking cows moved to Lake Breeze Dairy, Ron raised bull calves from the dairy to be steers. He also had a small beef herd. Today, Ron still has his beef herd and a crop farm. Many of the crops from his farm go to the cows at Lake Breeze Dairy. Lynn Davis grew up on a 50-cow dairy farm in northwest Wisconsin. After earning his bachelor's degree at UW-River Falls, Lynn went on to Iowa State University where he received an M.S. and Ph.D. in animal nutrition. Lynn and his wife, Catherine, who he met during grad school, moved to Appleton, Wisconsin in 1983 where they started Nutrition Professionals, Inc. with a former classmate. Nutrition Professionals, Inc. is a team of Ph.D. level, independent dairy nutritionists who develop and help farmers implement a customized feeding program, designed specifically for their dairy herd. While working as a dairy nutritionist, Lynn met Mark Diederichs, Ron and Rick Schwenck, and Doug Thiel. After more than 15 years of working together, Lynn approached each of them with an idea to form a partnership. Each individual farmer was considering expanding their smaller herds, but from Lynn's past experience, he knew they could be stronger and more successful together. In 2001, Lynn brought Mark, Doug and the Schwencks together to begin planning what is now Lake Breeze Dairy. He and Catherine were passionate about this project; they knew the farmers had similar goals, values, and work ethics. Ultimately, the partnership added Brian Gerrits, and the five families went on to develop Breeze Dairy Group. For the first 13 years, beginning after Lake Breeze Dairy was built, Lynn was accountable for the nutritional rations of the herds. After a several year transition, Lynn moved out of his role as the nutritionist in 2016 and now works as an advisor for the Breeze Dairy Group herds. Doug, Roger, and Roman Thiel grew up near Hilbert, WI. Growing up, their family milked 85 cows before selling the milking herd in 1998 and custom raising heifers and steers. Today, Doug continues to run the home farm by raising steers and growing crops. Roger is currently an Engineer for a general contractor that services a wide variety of industries, including dairy farms and food processing facilities. Roman works for the Appleton International Airport, Operations Division. Being partners with Breeze Dairy Group gives Doug, Roger, and Roman the opportunity to be a part of the agriculture community and allows them to continue pursuing their passion to be involved with their family roots as dairy farmers and stay connected with the production agriculture industry.